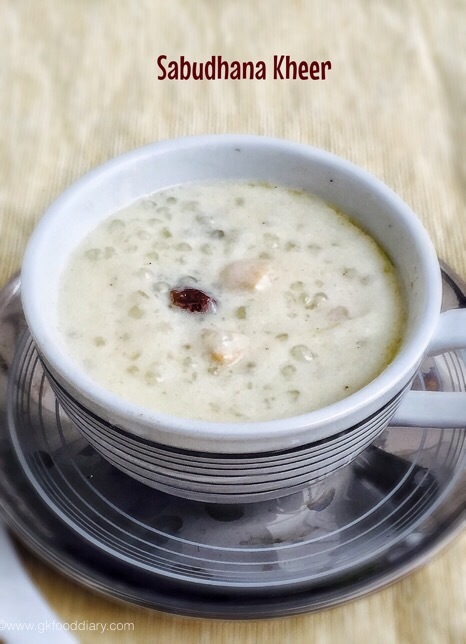 Sabudana kheer - easy kheer made with sago, milk & cardamom. Soak sago in water for 15 to 20 minutes. Soaking time depends on the sago varierty. Then wash the sago well in running water and drain the water. In a saucepan , take the drainded sago and add water till it immersed level. Cook in low flame until sago becomes transparent. Add the boiled milk now to the cooked sago and mix well. Simmer for 5 minutes until the milk thickens. Keep in low flame in order to avoid curdling. Add cardamom powder and give a quick stir. Then add sugar and mix well till it dissolves. Cook for five more minutes until the sago is blended well with milk. Switch off the flame once done. Finally garnish with ghee fried nuts if you prefer.